The world’s craziest biking party returned to Paul Ricard this year – and we set out to ride there on these! The Bol d’Or was a prime hunting ground for Brits in the 1980s. Every year we flocked south in our thousands to Paul Ricard, the sun-bleached GP circuit above the Mediterranean resort of Bandol. It was a party with a little racing thrown in for good measure, back before satnavs and mobiles even existed. Back then the Med felt like a very long way from home. Now to celebrate the Bol’s move from Magny-Cours back to its spiritual home at Ricard, Rich and Andy are taking their period project bikes all the way there and home again. For our brave lads the Med once again feels a very long way from home, and if they make it without the aid of a flatbed lorry we’ll be pleasantly surprised. Crashed then abandoned, our Paso 750 was bought in this state eight years ago for the princely sum of £400. Crashed to bits over a decade ago, it’s festered in its own mess ever since. Can the Paso really make it to the south of France under its own power? It seemed like such a long time to play with when, back in May, my ears heard my mouth claim that I could rebuild MCN’s long-abandoned Paso 750 and ride it to the Bol d’Or, this year reinstated at Paul Ricard. While the viscous coupling between my brain and my mouth clearly needed its filter changing, there couldn’t be that much wrong with the simple old Paso, could there? Last on the road at some point in the year preceding May 15 2004, when its last tax disc expired, its journey ended with Ducati’s second least loved creation (nothing is ever likely to surpass the Indiana) sustaining a series of impacts that saw its swathes of bodywork battered, the wheels squarer than even a dark-age inventor would deem acceptable, a smashed fork leg, and heaven knows how many other injuries. Rescued – after a fashion – by MCN in 2007, best intentions got surpassed by a lack of action, and despite benefitting from some round wheels and a new fork leg the project ground to an ignominious halt. Weeks, months, then years drifted by while it sat idly gathering dust. As I dragged it into the sunlight for the first time I couldn’t help but smile, partly at its ludicrous oh-so-90s streamlined shape that has always appealed to the quirky side of my taste range, and partly because I could see how stupid I’d been. The bodywork couldn’t boast an undamaged panel, and what little I could see through the gaps looked no less encouraging. A squeeze of the brake levers offered little solace, and a squeeze of the clutch lever resulted in a non-Newtonian reaction where a soft squeeze resulted in a sinking feeling, and a harder pull totally locked it up. The key wouldn’t turn in the ignition, the battery was kaput, and the ancient Michelin A/M59s couldn’t be marked with a screwdriver, let alone a thumbnail. Oh and 16in rims front and rear will make finding fresh tyres a particular joy. A look at the logbook reveals that it was registered on April 1, 1991. Could this be the longest April Fool, ever? Weber 44 carb had been replaced by a set of twin Dellorto 40s. A nice surprise. And with a bit of cajoling the key started to work the ignition, fresh fuel flowed in its veins, and after an hour of prodding and swearing it fired on one cylinder. Then the other. Then I saw the fuel gushing over the coils and switched everything off, while checking which fire extinguisher was nearest to hand. Problems, we have a few. Regrets? Give it time. A shopping list written with verbal diarrhoea turns into an Excel spreadsheet of doom as a mountain of parts from Wemoto, Hagon, Pipewerx, HEL, Ducati, eBay and my spare time all bend to the will of the mighty (awful) Paso. It looked suspect from the outside, and had all the action of a rusty hinge. With the cover whipped off I think I’d have preferred the rusty hinge. I’ve seen things recovered from the bottom of the ocean with less corrosion in evidence. Needless to say it all went straight in the bin. The basket and hub will hopefully be salvageable, but the in-cover slave looks a bit terminal. Tinkering will provide answers. It seems OK. Hoorah! Of course this might be an illusion, but it runs well without any (unusual) nasty knocking sounds or smoke. Can it cope with a 2200-mile thrash to the south of France and back after 12 or so years of inactivity? Other parts look more threatening as culprits for a failure right now, but I still have my doubts. Every single panel is damaged, some more than others. None of them are easy to replace, either. Most that appear online are also damaged. Without the funds to throw at getting a professional to repair it, we will just label the damage as ‘character’ and ‘patina’, and get on with more pressing problems. Bent, holed, painted by hand with a brush, and not original anyway – they’re going in the skip. British pipe-bending and can-building pros Pipewerx have stepped in with a set of Hawk Racing titanium cans and link pipes for a 750SS; so let’s hope I can make them fit, because they look great. One of the first jobs was to work out what rubber was available in the awkward 130/60 R16 and 160/60 R16 sizes. The answer was Shinko or Golden Tyre (actually the same tyres branded differently). Oh good. With little in the way of choice I ordered the Shinko option from tyres-pneus-online.co.uk at £119 delivered (great service, by the way). Who knows how they’ll ride. The damaged off-side fork has been replaced with a correct Marzocchi M1R, but the original Marzocchi shock is weeping aggressively. Thankfully Hagon make a beautifully- crafted replacement unit, which will perform much better than the Marzocchi did when it was new. A fork service is also needed. Andy bought this 41,000-mile K1 a year ago, after it had been sitting for six years. But it’s in good condition – currently miles better than the Paso. Only one previous keeper, and now carefully refreshed, proud owner Andy is giving little away. He’s hot favourite to complete the 2200-mile round trip. It almost seems unreal that I will be riding to the Bol d’Or at the famous Paul Ricard track in just a few weeks. Not only was endurance and GP racing at that iconic circuit a vivid memory of my youth, but this time I will also be riding my own BMW K1 to the event. The oddest part is that I haven’t been to Paul Ricard since the last endurance world championship race in 1999 when I rode my Suzuki SV650S there, then gunned it home in one long ride. All that feels like a million years ago now. I have to admit to being slightly nervous about making such a trip aboard a bike on which I have so far completed a 230-mile round trip around the Midlands and Peak District. And I ran out of fuel on that trip because the fuel light has stopped working – a fault I, and the experienced BMW main dealer which serviced it, have yet to trace. No-one is more aware of how odd a choice of bike a 1989 BMW K1 is to own, and I am completely versed in the spectrum of emotions when people see it. I bought the one-owner bike last year, spent a fair chunk of money getting it road-worthy after six years off the road, and have ridden it about 1000-odd miles since then. Riding 2200 miles to the South of France will be more distance in one hit than the bike has done since the turn of the century. Bizarrely for a bike that was pitched as the ultimate sports tourer (although BMW insisted at the time the massively heavy and rather underpowered K1 was a sports bike) it’s not that comfortable to ride over long distances; mainly due to the throttle stiffness, which I am rather dreading. Other than the errant fuel light, I think the big Beemer is in a good place, and it sailed through the last MoT and service without drama. 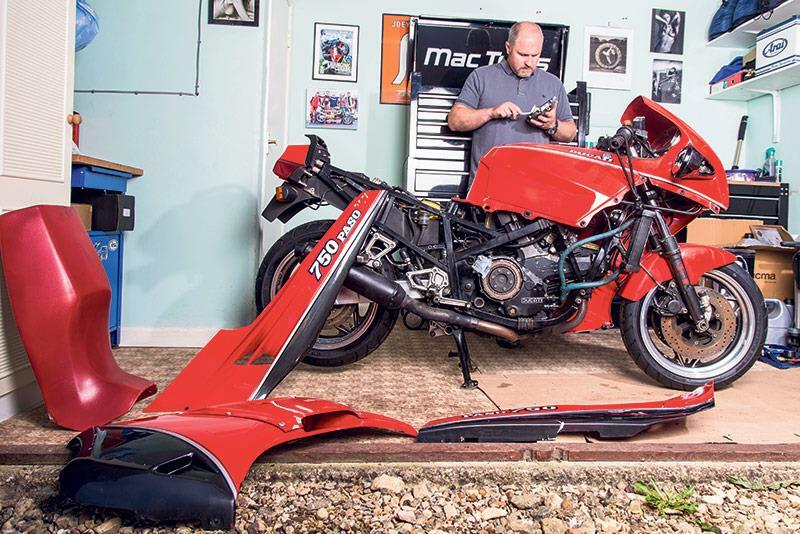 In contrast I look at the Ducati 750 Paso Rich Newland will be riding and, while I admire the amount of work he has put into returning a crashed, unloved and neglected bike to a competent runner, it still appears to be a long way from being ready for the trip. regards and the worries induced by taking a 26-year-old bike abroad is making me a little twitchy. I keep having to shut out my main recurring nightmare of being stranded on a remote French road, K1 with its blown engine and guts spilled on the road, and my bottom lip dragging on the hard shoulder. Watching the weather forecast for Bandol is becoming an obsession, not because I don’t want to ride in the rain but because I don’t want it to be too hot. The engine throws out so much heat it may well cook me to the bone. I bought the bike with the original BMW tankbag and panniers and was tempted to use them until I checked more closely. They smell a bit ‘funny’ to say the least and I’m not sure I want my clothes in them. I am going to use a Kriega DryBag on the back instead. The only modifications to the BMW are some Brembo Goldline discs and pads that are better than standard and the same price, along with some braided brake hoses. With the ABS it brings brake performance up to slightly above the need to put your feet down. The bike came with an ancient Michelin A59 front and Macadam rear, and they were so old and worn that fears of a highside while moving it around the garage were a genuine concern. New Metzeler Z8 Interacts are awesome. The numberplate is the original fitted when the bike was new in 1989 by BMW Park Lane in London, and because I am a geek I want to keep it safely at home, away from any potential damage. For £8.95 I bought one online, and it has a GB logo on it too.